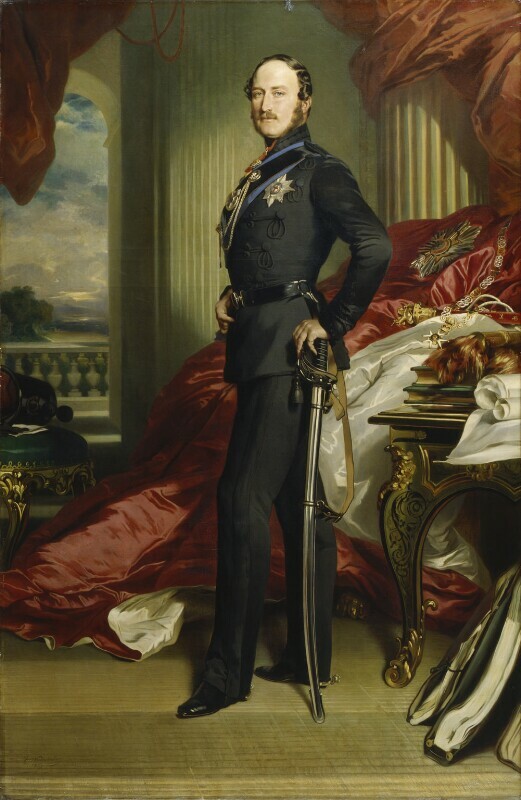 This is a full-size replica of Winterhalter's last portrait of Prince Albert, painted in 1859, and now in the Royal Collection; the latter was exhibited VE, 1892 (57), reproduced Marquis of Lorne, VRI: Her Life and Empire (1901), p 121, engraved by S. Bellin and lithographed by J. Vinter (examples in NPG). The Prince Consort is shown in the uniform of the Rifle Brigade, with the star and ribbon of the Garter; behind him are the robes of the Bath, and on the table the chain and star of the same order, with a field-marshal's baton. Pale blue(?) eyes, brown hair and whiskers. Dressed in a dark green uniform, with black sword belt, silver decorations, and blue sash. Scarlet and white robes behind. Boule table at right with books and papers. Gilded stool at left with green covering, and a helmet on top. Greenish landscape, blue sky beyond. Floor brownish; background colour greenish-grey. Commissioned by Queen Victoria, and presented by her, 1867.